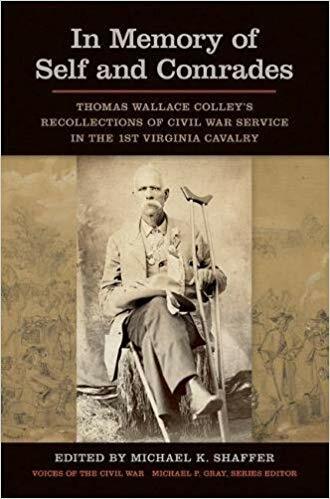 New from University of Tennessee Press is In Memory of Self and Comrades, the memoir of Thomas Wallace Colley’s service with the First Virginia Cavalry, edited by Michael K. Shaffer. This is of particular interest to followers of Bull Runnings because Colley’s recollections include the regiment’s movements before, during, and in the aftermath of First Bull Run. It’s brief (four and a half pages), but there are also three BR1 related letters included. We don’t have a lot of first-hand 1st VA Cav accounts, and hopefully the author will grant permission for me to provide transcriptions in the Resources section here. Michael K. Shaffer is an instructor at Kennesaw State University’s College of Continuing Education and Professional Education. He is the author of Washington County, Virginia, in the Civil War.